In today’s Reading Eagle, the editorial board weighed in on the The John Updike Society’s recent announcement that the grand opening of The John Updike Childhood Home would be delayed until October 2020, when it was decided that it would coincide with the Sixth Biennial JUS Conference hosted by Alvernia University. “The long delay just makes sense, given the nature of the largely volunteer effort and the need to raise more funds and collect additional materials. A site that’s expected to attract global interest should aim to be world class” (from “Editorial: Museum at Updike home should be worth the wait”). The society appreciates the Eagle‘s support and the support of neighbors and area residents. “Getting it right” has been the society’s mantra from the very beginning. John Updike deserves no less, and neither do the people of Shillington and Berks County. 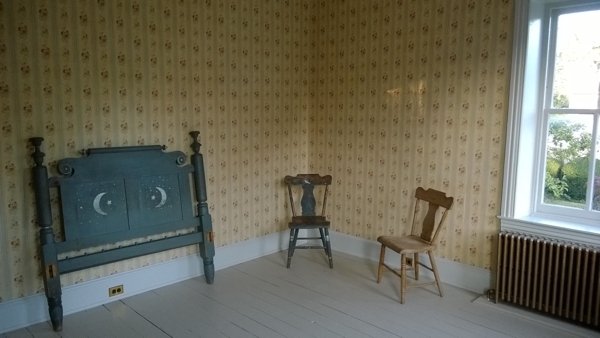 Pictured is a folk-art headboard and chairs that were painted by Linda Updike and her then-young son while they were living in the house at 117 Philadelphia Ave. Young Updike used to lie in that bed when he was home from school sick, and there he would watch his aspiring-writer mother work at her typewriter in the front guest bedroom. This entry was posted in House news, Restoration news. Bookmark the permalink.